Rubicon V.S.U. 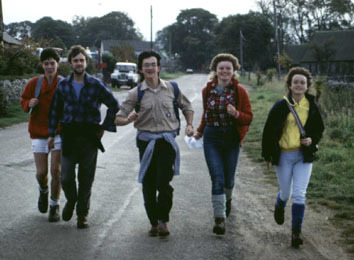 organised many long distance walks to raise money for charity. 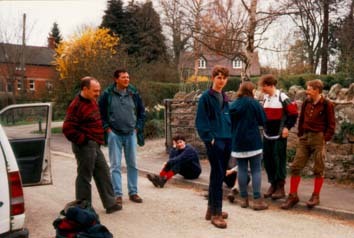 On the Shropshire Way in April 1995. Another stop on the Shropshire Way. The Belvoir Challenge. 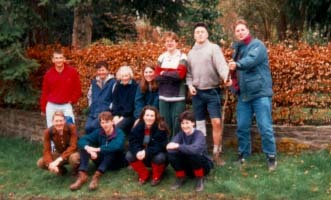 A 25 mile circular walk round Belvoir Castle in February 1993. There was a long running joke about the pronunciation of 'Belvoir' and I do not know if the ventures were ever sure if I was joking or not. 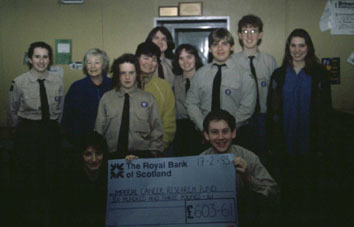 Cheque presentation for the Rivers way in February 1993. 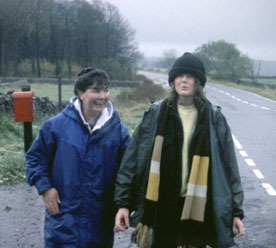 Edna Blount and Emily Hammond on the Rivers Way charity walk in October 1992. I had completed the Edale to Eyam walk on the Saturday and spend all day on Sunday supporting the other walkers from local hostelries, this is taken near the 'Duke of York'. Wilco and others on a practice walk in preparation for the Rivers Way. He kept on asking me if we could 'TAB the first 15 miles'. It was a long time until we learnt that it stood for Tactical Advance to Battle. However during the walk itself he dropped out fairly early. 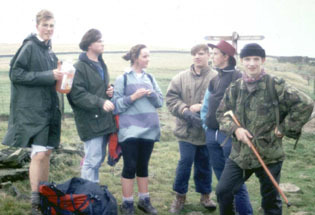 Part way round the 36 mile long Wilmot Wander in January 1992. 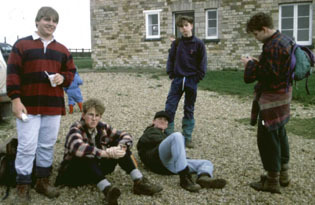 This is a circular walk round Derby starting at Chaddesden and going through Stanley, Morley, Little Eaton, Duffield, Quarndon, Mackworth, Radbourne, Findern, Swarkestone, Sinfin and back to Chaddesden. 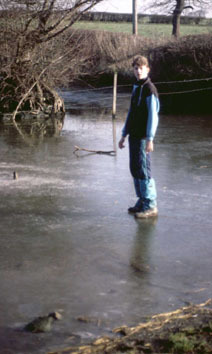 William standing on a farm pond at Vicarwood farm, Mackworth, almost half way round. This is the team that made it to the end in a grueling twelve and a half hours. The last couple of miles along Raynesway seemed to last forever. Having breakfast on the top of Beeley Moor. Anna on the way over Baslow Edge. 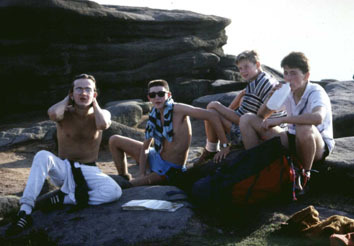 On Froggatt Edge with Richie Harris, Face, Lee and Bunce. 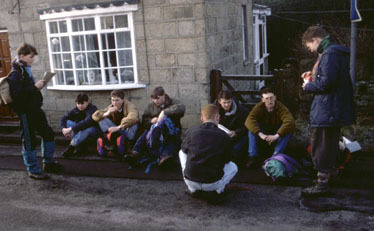 The end of the first day on the 'Yorkshire Bridge'. 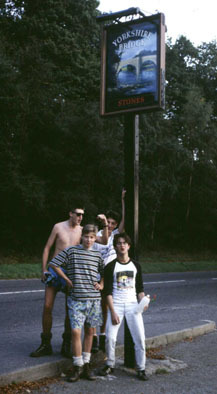 On the Limey Way September 1986. 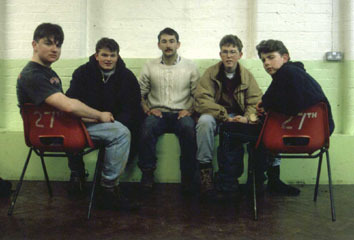 The 'A' team consisted of Robin Sibson, Me, Debbie Lloyd, Andrew King and Clive Rhodes. Racing to the support Van in Biggin. 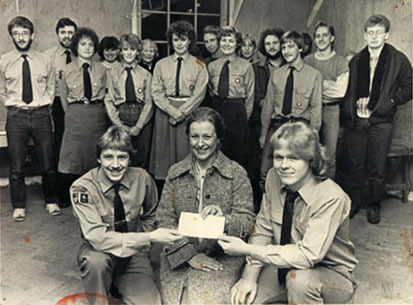 The amazing Belper Scout van. 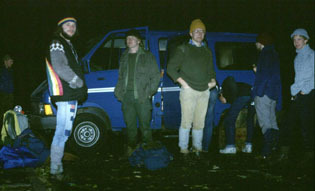 Friday 26th - Get picked up by the Minibus at 1.30am. Start walking on the at 3.15am, very dark, use touches until 7.15am. Walk through Baslow, Calver, Chatsworth and Endsor. Saturday 27th - My legs hurt coming into Bakewell and I finish there. Drive round with Ade and Sharon. We stay at Bakewell Y.H., go to the Red Lion in the evening and see Cathy Roachford from ITV. Sunday 28th - Drive round in the Minibus all day. Meet the others at the Packhouse in Crowdecote. Most people finish by 8pm. This is the presentation ceremony. White Peak Initiative walk. April 1983. Saturday 23rd - The team is Min, Charlie Knifton, Carl ? and Ian V. Leave Derby at 5.30am to drop the team off at Matlock. Me and AC are the support team. 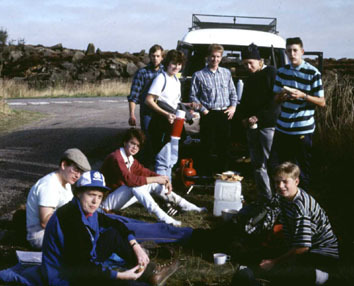 Drive up to Bakewell and cook 1/2 pound of bacon in the car park. See Pat Hallam in Chatsworth park on the way back. Lyke Wake walk. October 1982. Saturday 9th - Get picked up in the centre of Leeds by the minibus at 1am. Drive on to Osmotherly. Start walking at 3am. Me and Ian Vallans finish at 8pm. 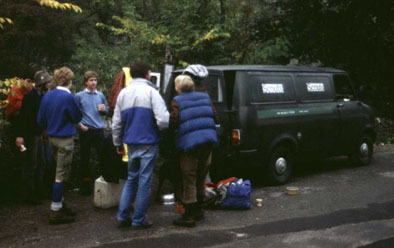 Camp at the Flask Inn.